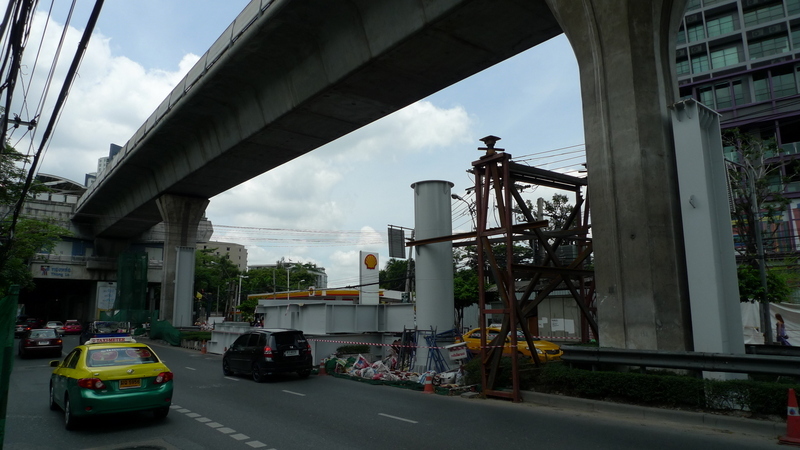 For a city of about 8 million people with generally poor mass transit systems, Krungthep (Bangkok) can sometimes surprise you with the usefulness of some of its infrastructure development. 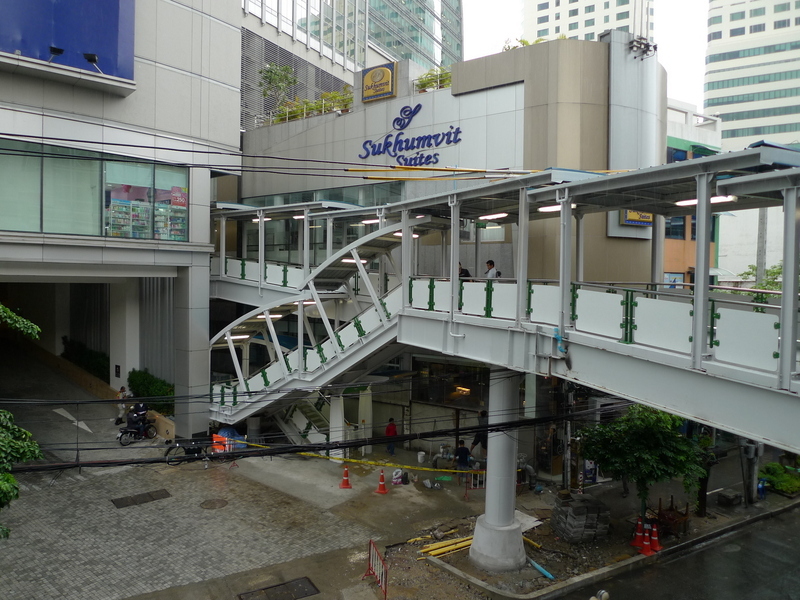 A good example of this are the pedestrian bridges built to connect some of the BTS Skytrain (elevated rail) stations to surrounding buildings. In a city with lots of traffic congestion, poor air quality, and even poorer footpath quality, an elevated way to get from the station to the buildings is a big incentive to get out of the car and into the mass transit. 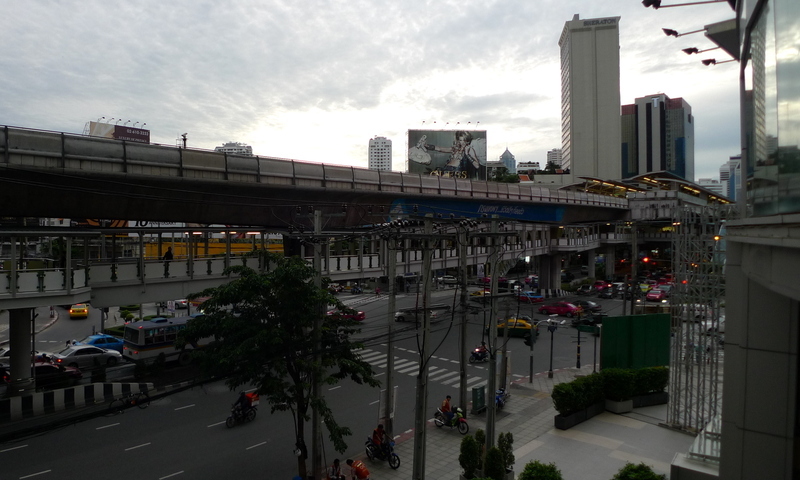 The junction of Asoke and Sukhumvit roads is an example of this bridge building trend. One of the busiest intersections in the city, crossing at street level has long been a hazardous activity for pedestrians. 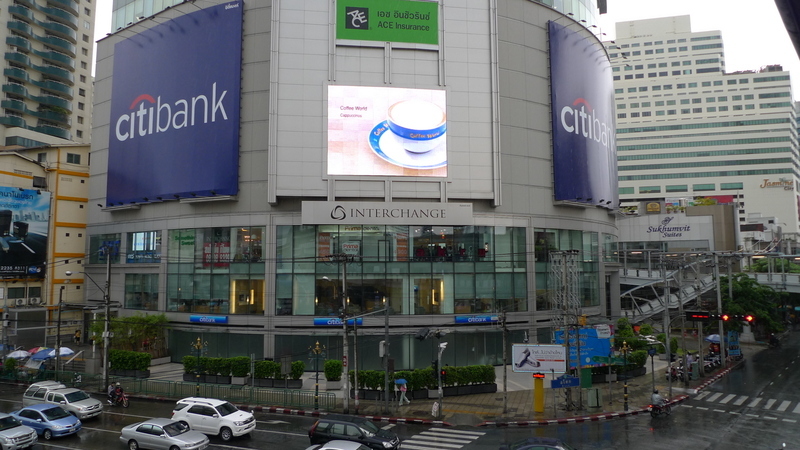 Located at the intersection of the MRTA subway and the BTS Skytrain, this junction houses three high-rise offices each with a few floors of retail, two large hotels, and a nine-story mall that is under construction. 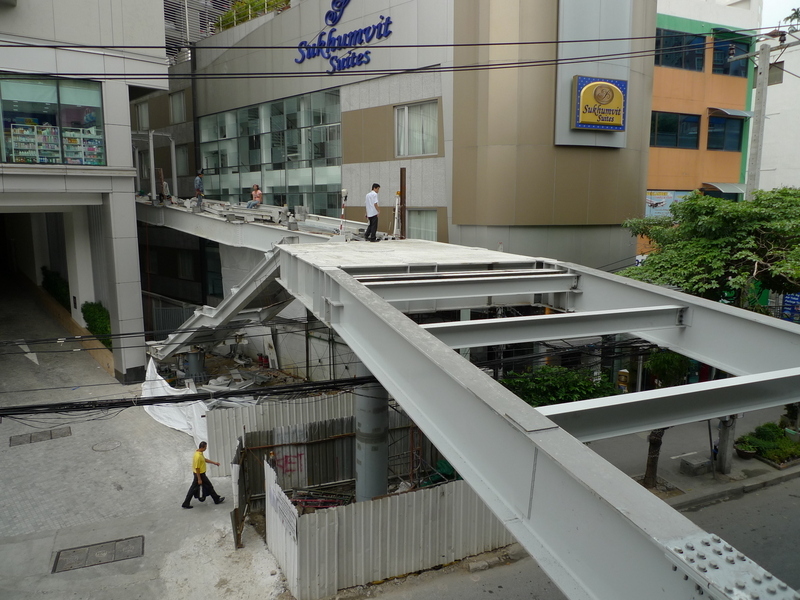 The pedestrian bridge built under the Skytrain viaduct, heading east from the Asoke station. 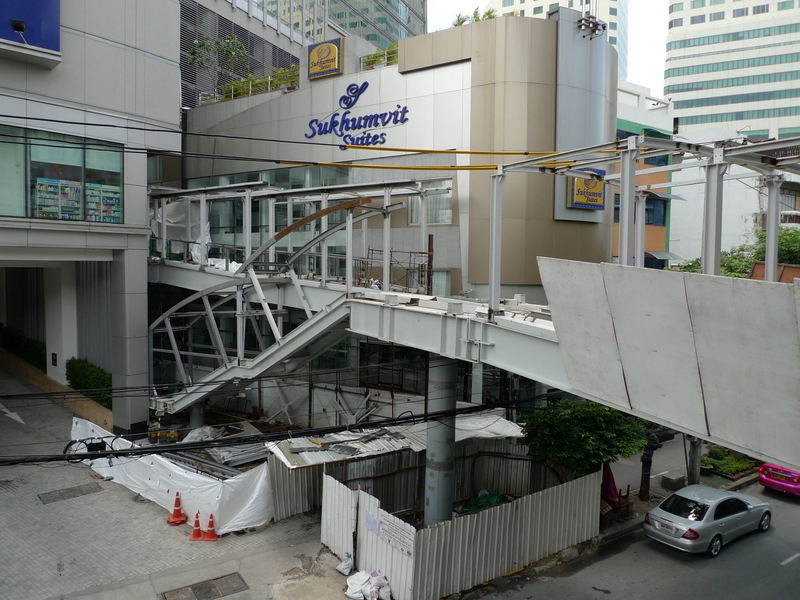 In the past two years, pedestrian bridges were built to the west of the BTS Skytrain station, connecting the two hotels and one of the three office buildings. 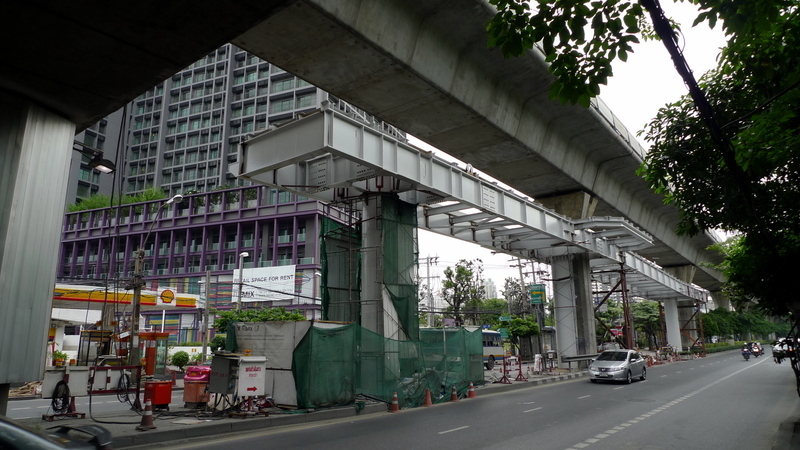 Then a large bridge was built to the east under the Skytrain tracks on Sukhumvit, crossing Asoke in a single cantilevered structure. On the east side of the junction the pedestrian bridge connected to the building in the southeast corner, but not to the newer building on the northeast corner. 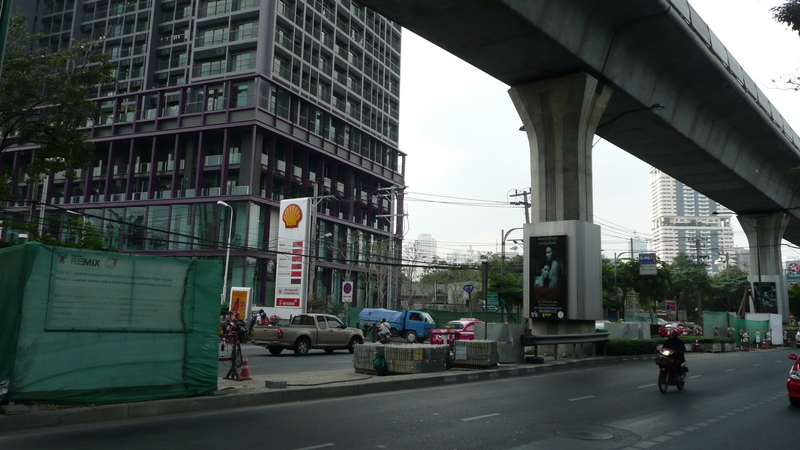 The northeast corner of the Asoke-Sukhumvit junction. Taken about six weeks ago, you can see in this picture how the new extension of the bridge will connect from the existing pedestrian bridge (shown in the very first picture in this entry) to the third floor of the building. At this point, just a part of the metal framework has been put into place. A few days later, crossbeams have been added and some of the concrete flooring is in place. You can also see how a stairwell to the street level – a requirement for all the bridges that connect to buildings to allow after-hours access to the pedestrian bridge – fits into the design. A few days after that, the columns for the roof structure are mostly in place. The following week, the roof itself has been added and most of the side panels are installed. Finally, about two weeks ago the bridge is finished and is nearly open. Lighting is working, as you can see. This will be much more convenient to access the building and its businesses. Certainly much easier than having to pass through the subway station to get there! Plus, you can now descend to the street and access businesses along this side of the street more easily. 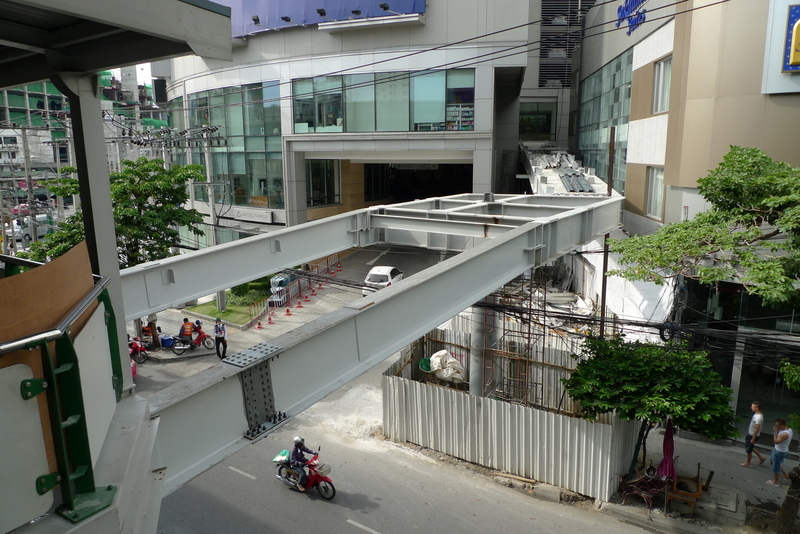 A second example of new pedestrian bridges is going up on the west side of the Thong Lo Skytrain station. 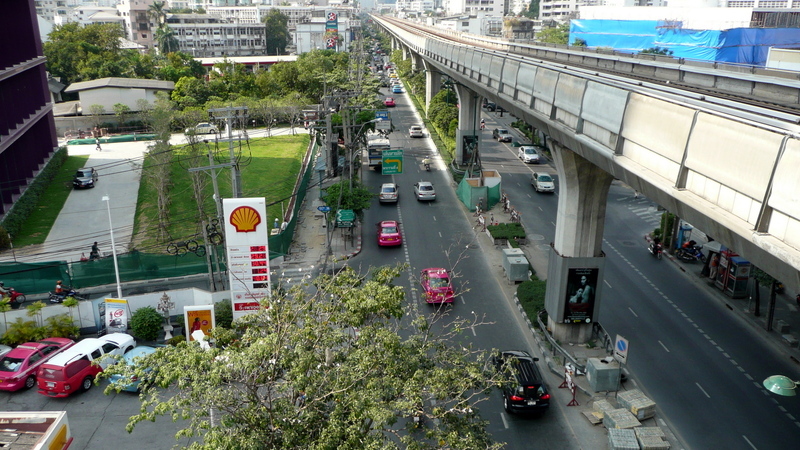 This is my neighborhood station and it lies just to the east of the junction of Thong Lo and Sukhumvit Roads, two stops to the east of the Asoke station. The main driver behind this bridge is the Noble Remix condo (the purple building) which will have two floors of retail below about 35 stories of residences. While the retail floors will get traffic from the residents, there’s no hope of anyone else traipsing over there unless it is convenient, and that means a pedestrian bridge. Looking west from the station’s westbound platform. Looking from the station platform to the west, you can see the condo on the left and the entrance to my alley on the right, just under the tracks before the first column. The rationale for needing a pedestrian bridge is that someone walking along the sidewalk has to go along the petrol station and then cross a small but busy alley between the petrol station and the condo. By building the bridge, it is safer and more convenient for pedestrians. At the same time, some stairs will be built on the north (righthand) side of the road in front of the international school – the building that is wrapped in blue construction tarp. This should be safer for students and their parents to access the Skytrain station. Looking back from in front of the international school towards the BTS Skytrain station, you can see the condo to the right and the first columns of the pedestrian bridge. This is about two months ago. As of four weeks ago, box frames were built around the train viaduct’s columns. A few weeks later, the bridgework was added to connect each of the support columns. For the past two weeks, no further work has been done including the connection to the station itself. I’m curious to see how quickly they will finish this project. It seems like it should not be difficult but each step has moved quite slowly. In the end, it won’t benefit me very much but it is another sign of progress in making the Skytrain more accessible to the area surrounding the station and and more user-friendly to potential passengers. This entry was posted in Uncategorized and tagged Asoke, Bangkok, Bridge, Krungthep, Noble Remix, Pedestrian, Public Transit, Skytrain, subway, Sukhumvit, Thong Lo, Thong Lor, transit by christao408. Bookmark the permalink. Houston has tried the system between the athletic center and surrounding hotels but Katrina interrupted the process. It’s nice to see construction progress that actually makes sense. @Fatcat723 – Any plans on picking it back up? @yang1815 – Kind of unusual, especially here. Pedestrian bridges are a cool idea! (Haven’t seen any in the few cities I’ve been to.) Looking at the busy streets in these pictures, I can see how helpful it would be to have a path for people to walk over the traffic. I have not heard anything definite as you know the whole city is being rebuilt. We have pedestrian bridges in my city Kota Kinabalu especially around the Segama shopping complex with the bridges connecting each block. They used to be an eyesore but once the city hall done painting them with bright colors, they actually look nice.Great photos by the way. Keep us updated with the work progress. @AzureRecollections – On a certain level, I realize that these are geeky infrastructure entries that have limited appeal to my readers. But the topic fascinates me, perhaps because I studied architecture in high school and considered urban planning as a career. Glad you appreciate the entries. @x_Reckless_x – A little fresh paint can do wonders, can’t it? @Fatcat723 – It has been eight years or so since I was in Houston. I imagine many things have changed since then. @decembriel – There are several cities in Canada (Toronto and Montreal spring to mind) that have subterranean versions of these, blocks-long mazes that connect buildings so people can get around in the winter without having to set foot outdoors. Progress is usually good. Hope the pedestrian walkways work as desired! It’s always interesting to see the changes in a city. It is good that they are trying to improve access to the street. I’m wondering in terms of accessibility for folks in wheelchairs, do these bridges help? Or do they have to go directly to a station to use an elevator? @ElusiveWords – Of the twenty or so stations in the Skytrain system, less than a quarter have elevators. This is an issue local disabled rights groups are pushing, but the sad reality is that the sidewalks are so impassable that getting to/from the station is a big issue in itself. For some stations like Asoke, you could go from the platform to the ticket mezzanine, exit the gates, and then roll into some of the buildings connected by these walkways. On the west side of the station, though, one hotel and one office buildings are connected to the walkway by steps! D’oh! i can only wish we have more of them here in jakarta. we are IN NEED to have those kind of bridges. i’m still counting the days where the people would opted for the bridge over street crossing, and for the government to smarten up in building things that are actually worth building. 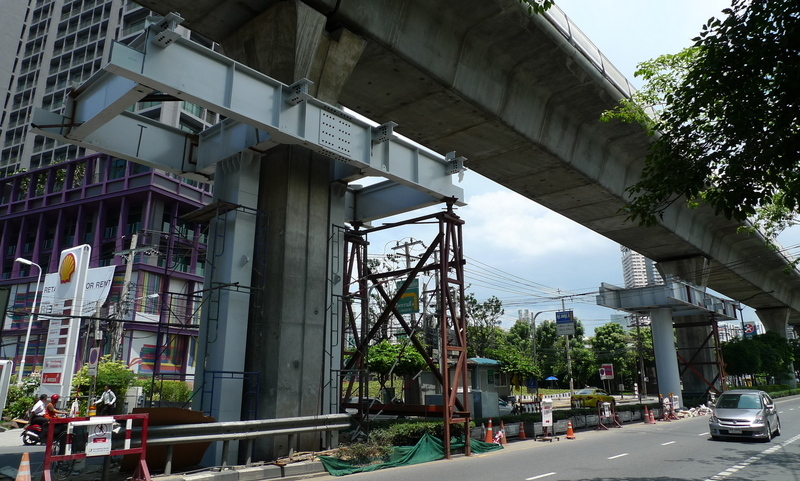 @rudyhou – So Jakarta isn’t the place to go to see masses of useful, pedestrian-friendly bridges, huh?